After the speech the Royal Court issued a press release which contained quite interesting information about the many changes that will affect the members of the Dutch Royal House. The official programme for the abdication and investiture will take place on 30 April 2013. Her Majesty the Queen will sign the Instrument of Abdication at the Royal Palace, Amsterdam. The investiture of His Majesty the King will then take place at the Nieuwe Kerk in Amsterdam. From 2014 onwards, King's Day will be celebrated on 27 April, the birthday of the Prince of Orange and future King Willem-Alexander. In 2014 it will be celebrated by the Royal Family in Amstelveen and De Rijp. These municipalities will be able to use the programme that has already been developed for the planned celebration of Queen's Day on 30 April this year, which will assume a different character because of the abdication and investiture. When Queen Beatrix abdicates, His Royal Highness the Prince of Orange will become King Willem-Alexander, and Her Royal Highness Princess Máxima of the Netherlands will become Queen Máxima. They will both be addressed as 'Your Majesty'. After abdicating, Queen Beatrix will be called Her Royal Highness Princess Beatrix of the Netherlands, Princess of Orange-Nassau, etc. As soon as the Prince of Orange ascends the throne, his eldest child, Her Royal Highness Princess Catharina-Amalia, will be the first in line to the throne. She will then become the Princess of Orange (under section 7 of the Membership of the Royal House Act). A truly historical event is going to take place in April. Oh how much I would love to be present! It feels strange that Queen Beatrix will not longer be the Queen of the Netherlands. She has held that position for a little more than three quarters of my life, and she has always been one of my favourites. A Queen with capital Q. Devoted, loyal, constitutional, popular and distant at the same time. She deserves to take it a bit easier after all these years. And I am confident that the new king - who will use his name Willem-Alexander and not Willem IV - will do well in the position he has been groomed for and will also become a popular monarch as the years go by. Updated on Tuesday 29 January 2013 at 19:45 (link to the Queen's speech in English added). The Dutch Royal Court has announced this afternoon that Queen Beatrix of the Netherlands, b. 1938, is going to address the nation on Dutch TV and radio at 7 p.m. (GMT+2). Not surprisingly the Dutch media, for instance De Telegraaf, has started to speculate about a possible abdication in favour of Queen Beatrix' oldest son, Prince Willem-Alexander, b. 1967. Queen Beatrix succeeded to the throne on 30 April 1980 following the abdication of her mother, Juliana, who had reigned since 1948 when Queen Wilhelmina abdicated. In other words, if Queen Beatrix, who is to celebrate her 75th birthday on 31 January, is going to announce he abdication tonight, she will follow in the footsteps of her mother and grandmother. Prince Willem-Alexander, Prince of Orange, is married to the Argentinian-born Princess Máxima and has 3 daughters. If the time allows it I will return with more comments later today. 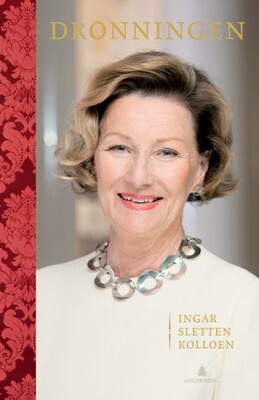 Just before Christmas in 2012 I mentioned that I had won 3 book gift cards, and I also mentioned two books I would love to read, Ingar Sletten Kolloen's biography about Queen Sonja, Dronningen, and Anders Heger's Egner. En norsk dannelseshistorie about the Norwegian author and artist Thorbjørn Egner. In my blog article The blog - standing published on 2 January this year, I mentioned that I was thinking about writing a series of Reading list articles. This will the the first one. I got the Queen Sonja biography for Christmas, but haven't started reading it yet. The publisher is Gyldendal Norsk Forlag, and the ISBN is 978-82-05-39525-1. Prince: NOK 449. After Christmas I won even two more book gift cards in connection with my company's wine lottery, and today I finally got the time to get to the bookstore to use my cards. The first book on the list was the above-mentioned biography about Thorbjørn Egner. It was published by Cappelen Damm in October 2012 and costs NOK 399. ISBN: 978-82-02-39997-9. Egner's ancestry, which I worked on last fall together with other committee members, can be viewed at the Norwegian Genealogical Society's Slektshistoriewiki (Genealogy Wiki). 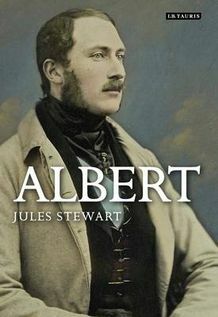 The second book I purchased was the historian Jules Stewart's biography Albert. A Life, which as the title suggests deals with Queen Victoria's husband Prince Albert of Saxe-Coburg and Gotha. I haven't read anything about the biography, but it looks interesting. I have of course read a lot about Albert before, but only in articles and biographies about other royals. I guess it was on time. The biography was published in 2012, the publisher was I.B. Tauris, the ISBN is 978-1-84885-977-7, and here in Norway it cost NOK 249 at Norli, in the UK £19,99. Do people really fall for such silly prices, I wonder? I brought with me my daughter, now 2 1/2 years old, into the bookstore today, and of course she was allowed to pick a couple of books as well. The first she fell for was a translation of Julia Donaldson's Gruffalo (original title: The Gruffalo (!)). It was the 2nd edition from 2007, ISBN 978-82-53-03025-8, priced at NOK 119. 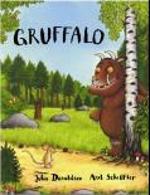 See the official Gruffalo website for more details. My daughter was so happy with it that she took it with her to bed tonight! I guess I will have to read it to her over and over again in the days and months to come! The Norwegian translation is published by Omnipax. The Gruffalo movies - one of the Norwegian TV channels broadcasted two short films during Christmas - are quite entertaining as well. 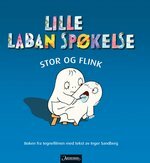 The second book my daughter picked was Lille Laban Spøkelse. Stor og flink ("Laban The Little Ghost. Big and clever") by the Swedish Inger and Lasse Sandberg, and in Norway published by Aschehough (ISBN 978-82-03-25260-0). The book is based on the animation movie. It seems that the English version of Laban is named Godfrey, for some reason. The book came together with a little Laban/Godfrey doll, so I am not sure what my daughter really fell for. She looked through the book later today and seemed to like it, though. A memorial service for Princess Margarita of Baden, who died on 15 January 2013, was held at the Serbian Orthodox Church of St. Sava in London today, 24 January 2013. The service was officiated by Bishop Dositej of Great Britain and Scandinavia and Bishop Andrej, Vicar Bishop of the Patriarch Irinej of Serbia. ... Margarita became interested in all things Yugoslav, especially in the Serbs and the Serbian orthodox church. She was very approachable – she was a real Serbian people’s princess. My family and I and the Serbian people shall miss her greatly. May dear Margarita rest in peace! VJEČNAJA PAMYAT! The funeral service and internment - the date is unknown to me at present - will be held at Salem Palace (Schloss Salem) in Germany. Updated on Thursday 24 January 2013 at 23:45 (spellings). Crown Prince Alexander of Yugoslavia at his office in London, with the portrait of his father, King Peter II, in the background. The photo was taken in November 1995. The casket of King Peter II of Yugoslavia (1923-1934-1945-1970) arrived at the Nikola Tesla Airport in Belgrade in the afternoon today, 22 January 2013. Present at the airport were Crown Prince Alexander, Crown Princess Katherine, Prince Peter, Prince Philip and Prince Alexander, together with Crown Princess Katherine’s daughter Alison, Ivica Dacic, Prime Minister of Serbia, Prof. Dr. Oliver Antic, advisor to the President of Serbia H.E. Mr. Tomislav Nikolic, Bishop Atanasije of Hvosno and members of the Committee for transfer of remains of members of the Royal Family, in addition to an honour guard as well as representatives of the Serbian Army. The casket was brought to the Royal Compound in Dedinje and placed with full honours in the Royal Palace Chapel, St. Andrew the First Called, where Patriarch Irinej of Serbia served a requiem. The late king's remains were exhumed last week in Libertyville, outside Chicago, Illinois, USA. According to B92.net, the reburial will take place at the Royal Mausoleum of St. George in Oplenac in the spring, together with the reburials of of King Peter II's mother Queen Marie (now buried at Frogmore, Windsor, UK), his wife Queen Alexandra (Tatoi, Greece) and his brother Prince Andrew (Andrej) (Most Holy Mother of God Serbian Orthodox Monastery, Third Lake, Illinois, USA). For photos from the requiem, go to B92.net's Serbian version. For a video, go here. For photos of the late King Peter II, go to the Royal Family of Serbia's official website. Belgrade, 22 January 2013 – The casket of HM King Peter II of Yugoslavia arrived at Belgrade Airport Nikola Tesla at 2 pm today. The grandson of King Peter II, HRH Prince Alexander (grandson) accompanied the casket on the King Peter II last flight home. Meeting the casket of HM King Peter II at the airport were Their Royal Highnesses Crown Prince Alexander, Crown Princess Katherine, Prince Peter, Prince Philip and Prince Alexander, together with Crown Princess Katherine’s daughter Alison, H.E. Mr. Ivica Dacic, Prime Minister of Serbia and Prof. Dr. Oliver Antic, advisor to the President of Serbia H.E. Mr. Tomislav Nikolic, His Grace Vicar Bishop of Hvosno Atanasije and members of the Committee for the transfer of remains of members of the Royal Family, with the Serbian Army honour guard and representatives of the Army of Serbia. The Remains of the late King were then escorted by the police to the Royal Chapel of St. Andrew the First Called beside the Royal Palace in Dedinje, the casket was saluted by a great number of citizens all the way from Belgrade Airport to the Royal Palace . The coffin of the late King, was then covered by a Serbian flag and Royal Regalia, and was placed in the Royal Chapel. His Holiness Patriarch Irinej of Serbia officiated the Requiem for the King, together with Their Graces Bishop Atanasije of Hvosno, Bishop Joanikije of Budimlje and Niksic and Bishop Andrej of Remeziana, in the presence of the Royal Family, Muhamed ef. Jusufspahic, Mufti of Serbia, other religious leaders, Prime Minister Ivica Dacic of Serbia , members of the Advisory bodies to the Crown and a huge number of citizens of Belgrade and Serbia who gathered in front of the Royal Chapel. After the service, His Holiness Patriarch Irinej of Serbia emphasized in his address: "We have finally welcomed this sad and happy day, longly wished and expected . It is a day of historical importance for the entire Serbian people and its history“. H.E. Mr. Ivica Dacic, the Prime Minister of Serbia, also gave an address and expressed his satisfaction on behalf of the Government of Serbia, citizens of Serbia and in his own name, for "we are present here today at the first of the events planned for this year, that we bring back the bodies of our rulers to Serbia . Without the lineage of Karadjordje, Serbian history almost could not have been written. The Government of Serbia will do anything in its power for the remains of the other Karadjordjevic family members to be brought back to our country". Professor Oliver Antic, PhD, advisor to the President of Serbia and member of the Board for the return of the remains of the Karadjordjevic Royal Family members, said: "the President of the Republic of Serbia Mr. Tomislav Nikolic said that he is today here together with us although he is paying an earlier planned official visit to a foreign country. Our country is being protected by justice and tradition. When these two elements are bonded, then we have the safety of the state and the people“. After the service, His Royal Highness Crown Prince Alexander II, son of HM King Peter II, made a moving speech: “This is a very emotional time for me and my family. It is a dream come true. My father King Peter is finally home and soon to be with his ancestors in Oplenac. I would like to especially thank His Holiness Patriarch Irinej for being here today, and for all of his prayers. We gathered here today for this event full of dignity and historic symbolism. 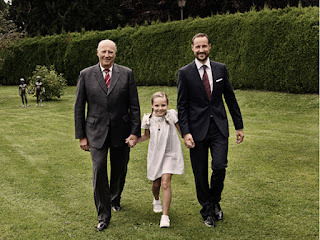 This year is the 90th Anniversary of the birth of my father, King Peter II, and 72 years since he had to leave his beloved country after the Nazi invasion, and to spend the rest of his life in exile. My father died forty two years ago, and was buried in a distant land, but surrounded by friends and people who were devoted to him. He often spoke about his desire to return home. Obviously, so much time had to pass by, so many historical events, for one historical injustice to be rectified, and one simple human wish to come true. It was my father's greatest desire to come back to his fatherland, because above all he loved his country and his nation. He often spoke about that, always when the two of us were together. Today, he finally came back to Serbia , to the country of his ancestors and his compatriots. He is coming back to help us to understand our history, and how to respect it. Today, all of us together are sending an important message from this place to the world: The citizens of this country pay respect to all of those who took part in creation of its history. I would like to warmly thank our President Mr. Nikolic, and Prime Minister Mr. Dacic, on this joint endeavour, as well as the State Committee for transfer of remains of he members of Karadjordjevic Royal Family. I thank all members of the Government for their support. I owe special gratitude to Professor Oliver Antic, for his personal initiative and engagement. The Royal Family warmly thanks His Holiness Patriarch Irinej of Serbia, His Grace Bishop Longin of Middle and Western America, the Army of Serbia, Guard and Gendarmerie, H.E. Mr. Vladimir Popovic, ambassador of Serbia to the United States of America, Mr. Desko Nikitovic, Consul General of Serbia in Chicago, Hon. Branko Terzic, lawyer Mr. Tom Karacic, Association “Sveta gora” and all those who contributed substantially over previous years that this event of historic importance for our nation and our state becomes possible. Updated on 22 January 2013 at 20:55 (press release added), last time on 23 January 2013 at 20:30 (minor text modifciation to stress that one will wait for the reburial of King Peter II until the remains of the three other members of the Karadjordjecic dynasty have returned to Serbia). Princess Margarita of Baden, who was married to Prince Tomislav of Yugoslavia from 1957 to 1981, died on 15 January 2013 in her home in Farnham, Surry, England. Her obituary was published in The Telegraph (Telegraph.co.uk) on Sunday 20 January 2013. It was announced at the official website of the House of Hohenzollern today that Princess Sophie, wife of the head of the Prussian Royal Family, Prince Georg Friedrich, gave birth to twin boys on Sunday 20 January 2013 in Bremen, Germany. Mit großer Freude und Dankbarkeit gibt der Chef des Hauses die Geburt seiner Söhne Carl Friedrich und Louis Ferdinand bekannt, die am 20. Januar 2013 in Bremen zur Welt gekommen sind. Prinzessin Sophie und die Zwillinge sind wohlauf. Prince Georg Friedrich of Prussia and Princess Sophie of Prussia, née Princess of Isenburg, were married at Potsdam outside Berlin on 25 August (civ. )/27 August (rel.) 2011. Prince Georg Friedrich is a great-great grandson of Emperor Wilhelm II. Photo (2012): Julia Marie Naglestad/The Norwegian Royal Court. HRH Princess Ingrid Alexandra of Norway celebrates her 9th birthday today, 21 January 2013. 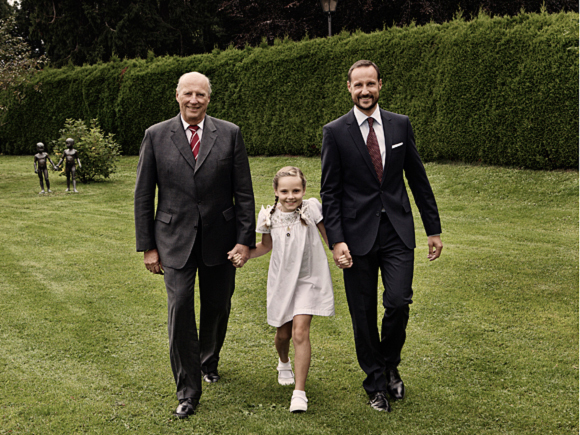 The Royal Court marked the occasion by releasing a photo taken last year of the princess with her grandfather King Harald V and her father Crown Prince Haakon. The princess was born at Rikshospitalet (the National Hospital), Gaustad in Oslo on 21 January 2004 at 9.13 a.m. Her name was formally announced in an extraordinary Council of State the day after. Updated on Monday 21 January 2013 at 23:58. Their Royal Highnesses Crown Prince Alexander, Crown Princess Katherine, Princes Peter, Philip and Alexander, together with Crown Princess Katherine’s daughter Alison, will wait for their father, grandfather and father in law at the Belgrade Nikola Tesla Airport on 2 pm. H.E. Mr. Ivica Dacic, Prime Minister of Serbia and Prof. Dr. Oliver Antic, advisor to the President of Serbia H.E. Mr. Tomislav Nikolic and member of the Committee for transfer of remains of members of the Royal Family, with representatives of the Army of Serbia will also attend the event. His Holiness Patriarch Irinej of Serbia will serve the requiem for the late King starting on 3 pm, at the St. Andrew the First Called Royal Chapel in Dedinje. Details of when King Peter II's coffin will be taken to the Royal Mausoleum at Topola outside Belgrade will be given later. The organisers behind the annual Royalty Weekend, which in 2013 will take place on 6-7 April at Ticehurst and Flimwell Church of England Primary School, Steellands Rise, Ticehurst in East Sussex, England, have sent yet another updated program for the conference. There will also be other royal authors present including Janet Ashton, Robert Golden, Coryne Hall and Ilana Miller. For another article on this subject earlier in January, go here. I really enjoyed the Royalty Weekend in 2011 and can heartily recommend it to everyone who are interested in royal history! Crown Prince Alexander of Yugoslavia (Serbia), only son of King Peter II of Yugoslavia (1923-1934-1945-1970), has for a long time wanted to bring his father's remains home for reburial in Serbia. King Peter II died in exile in Denver, Colorado in 1970 and was buried at the St. Sava Monastery Church in Libertyville north of Chicago, Illinois. 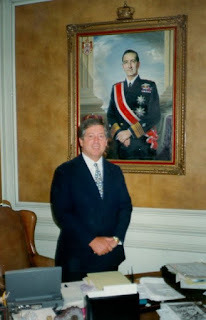 The Office of Crown Prince Alexander confirmed yesterday, 18 January 2013, that the plans to bring King Peter II's body home are finally to be carried out. According to Royal Musings, the remains will be brought home to Serbia on Tuesday 22 January 2013. I am sure more details will be given at Royalfamily.org, the website of Crown Prince Alexander, soon. The reburial of King Peter II will take place only 3 months after the Yugoslavian Prince Paul (Pavle) (1893-1976), Princess Olga (1903-1997), née Princess of Greece, and Prince Nicholas (Nikola) (1928-1954), were brought home for reburial at Oplenac on Saturday 6 October 2012. Queen Marie of Yugoslavia, née Princess of Romania (1900-1961), wife of King Alexander I of Yugoslavia and the mother of King Peter II, is interred at the Royal Burial Grounds at Frogmore, Windsor. I haven't read anything about it yet, but I wouldn't rule out a reburial for her as well tok take place at a later stage. Princess Margarita of Baden, b. Salem, Germany 14 July 1932, died at Farnham, Surrey, England on Tuesday 15 January 2013, 80 years old, after a long illness, cf. the announcement by the Office of Crown Prince Alexander of Serbia (Yugoslavia) and the German newspaper Südkurier (Suedkurier.de). Princess Margarita was the oldest child of Margrave Berthold of Baden (1906-1963) and Margravine Theodora of Baden, née Princess of Greece and Denmark (1906-1969). Her younger brother. Margrave Maximilian (Max), b. 1933), is today the head of the Grand Ducal House of Baden. Princess Margarita's mother Princess Theodora was the 2nd daughter of Prince Andreas of Greece and Denmark and Princess Alice of Greece and Denmark, née Princess of Battenberg. Princess Margarita was thus a nice of Prince Philip, of Edinburgh, and a first cousin of the Prince of Wales. Princess Margarita married in 1957 Prince Tomislav of Yugoslavia (1928-2000), the second son of King Alexander of Yugoslavia and Queen Marie of Yugoslavia, née Princess of Romania. The princess was at the time she met Prince Tomislav working at a hospital in England, and continued to live there after the wedding. The couple divorced in 1981. In the last years the princess lived in Farnham, Surrey. Prince Margarita and Prince Tomislav had two children together - Prince Nicholas and Princess Katarina. She also left behind two grandchildren and one great grandchild. The funeral service will take place at the Serbian-Orthodox Church of St. Sava in London, while her last-resting place will be at Salem Palace (Schloss Salem). Updated on Thursday 17 January 2013 at 10 p.m. (more exact place of death added, cf. Eurohistory 16 January 2013). Their Royal Highnesses The Duke and Duchess of Cambridge are delighted to confirm they are expecting a baby in July. The Duchess's condition continues to improve since her stay in hospital last month. The annual Royalty Weekend will this year take place on 6-7 April at Ticehurst and Flimwell Church of England Primary School, Steellands Rise, Ticehurst in East Sussex, England. Booksellers van Hoogstraten of the Hague will be in attendance, and there will be a bring and buy Royal Ephemera sale. I attended the Royalty Weekend for the first and so far only time in 2011, and I will attend again this year. Hope to see as many of you there! Under the previous Letters Patent a daughter of the eldest son of the Prince of Wales would have been styled Lady. For more information on British royal titles, go to Heraldica.org. See also Telegraph.co.uk 9 January 2013. The Duchess of Cambridge's pregnancy was announced on 3 December 2012. The Office of HRH Crown Prince Alexander of Yugoslavia (Serbia) announced today that it had turned all the Facebook profiles into one. The new profile can be found at http://www.facebook.com/NJ.K.V.Prestolonaslednik.Aleksandar. I have decided to continue my tradition of giving some statistics for my blog, as well as to look back on the year that has passed and to point at topics of interest and what one can expect of this blog in 2013. My previous statistics articles were published on 1 January 2011 and 8 January 2012. The number of articles in 2012 went down from 104 to 98 compared with 2011, but that was more or less as expected. I don't have enough time to write more than 1-2 articles a week on average. Obviously I had more spare time in the first part of the year (I wrote 13 in January and 14 in February 2012), while only 2 in July (I was abroad for 3 weeks in July and August). The number of unique page views is as of today (2 January 2013) 173 391, as compared to 95 537 on 8 January 2012 (counting from August 2009), so the blog is well visited, even though it is not updated as regularly as one could have wished. The latter was a follow-up to my first article on the subject, which was published on Friday 20 January 2012. It should be added that the numbers show unique page views. The Princess Athena article has in reality got 5359 hits as of today, while the article about Countess Ruth of Rosenborg's death has been viewed 1338 times. Last year I was still amused that the Countess Ruth article still topped the statistics, but fortunately it has been passed by 3 other articles during 2012. The first to take Ruth down from the throne was the article covering the false pregnancy news - as it later turned out - about Princess Tatiana of Greece, the spouse of Prince Nikolaos, the third child of former King Constantine. The number of views really took off when the postscript was added on 12 March 2012, telling that she was not pregnant at all. A somewhat embarrassing story, and I can only wish I had been more critical when I wrote the article back in October 2011, although I guess most readers would agree with me that Billed-Bladet should take most of the blame! As I am very interested in US American history and politics, I was very ambitious in writing several articles on the primaries in January, but it all stopped in February. I just didn't have the time to follow it up on my blog, but used my Twitter account instead. I wrote on my blog on 3 January 2012 that "It is of course far too early to predict who will win the election in November, but as of now I think the chances of Mitt Romney becoming the next US President is greater than that Obama will be re-elected", stating the weak economy as the reasoning behind my view point. I made all the necessesary reservations, of course. During the spring of 2012 I gradually changed my mind, as I came to realize that Romney had even more weaknesses than the president had. The voters, or at least the small majority, didn't manage to identify themselves with the GOP candidate, and he wasn't especially liked by the right wing of the Republican party either. Most in the know predicted the presidentical race to be close, and it was, but most of the time President Obama was leading the polls in the most important states, so it shouldn't really come as a big surprise that he won. Still, considering the bad state of the economy, I find it somewhat amazing that Obama actually pulled it off. The US political dynasties still fascinate me. It is interesting to note that yet another Kennedy - Joe Kennedy III - was elected to the House of Representatives. One of the more moderate Republican voices in the Senate, Scott Brown, lost the election against Elizabeth Warren, but might get a comeback later in 2013 as John Kerry's senate seat becomes vacant. It will be interesting to see how Obama will perform in the next four years. There are many aspects of the 2012 election and the candidates which could be interesting to discuss further, but I will leave it, at least for now. There are so many other blog topics worth discussing as well. It is safe to say, however, that considering the many biographies I have read on American politicians during 2012, I must say that my interest in US history and politics have deepened even further during the year! Best novel? It took a while for me to discover Tess Gerritsen, but her crime novel The Surgeon from 2002 was excellent. One of the best crime novels I have ever read, and I have read a lot! Her latest, Last to die, is also recommendable. There will be lots of topics to write about and discuss in 2013, I am sure. In Norway the general election will take place in September. Exciting! The forthcoming royal birth in the UK will give lots to write about, and hopefully the process to the change the succession law will go well in all the countries Queen Elizabeth II is head of state of. There will be a royal wedding in Sweden in June, and the Romanovs will celebrate their 400th anniversary. I can't promise that the number of articles will be higher in 2013 than in 2012. I expect, however, that the majority of my articles will cover genealogy (including cemeteries) and royalty. Anyway, thanks for stopping by! And once again I wish you all a very happy new year! Photo: Outside the West Virginia State Capitol in Charleston with the Lincoln monument, July 2012. 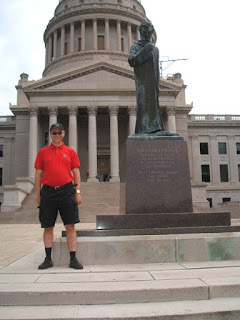 Inscription: "Abraham Lincoln created the state of West Virginia by proclamation and signature / West Virginia joined the Union June 20, 1863". Updated on Thursday 3 January 2013 at 08:05 (link added to Painting in Canada article). According to the Norwegian local newspaper Østlendingen, which mainly covers news from the Elverum area and Østerdalen in Hedmark county, Crown Princess Victoria, her husband Prince Daniel, their daughter Princess Estelle and several friends spent the New Year's weekend in the ski resort of Trysil. The group is said to have arrived on 28 December and lived in a rental cottage south of Trysilfjellet. On New Year's Eve the group had a burger lunch (made of either moose or lamb meat) at Knettsetra which is situated at the alpine ski resort at Trysilfjellet ("The Trysil Mountain"). Updated on Thursday 3 January 2013 at 20:30 (subject title modified).